It’s a great pose, Hidekichi, but not M105 record. Hidekichi Miyazaki, the “Golden Bolt” of masters track, lost his M100 100-meter world record Sunday to Don Pellmann but showed his fitness Wednesday by running the race in 42.22 a day after his birthday, according to an explosion of media reports. But all those reports are wrong in one respect. 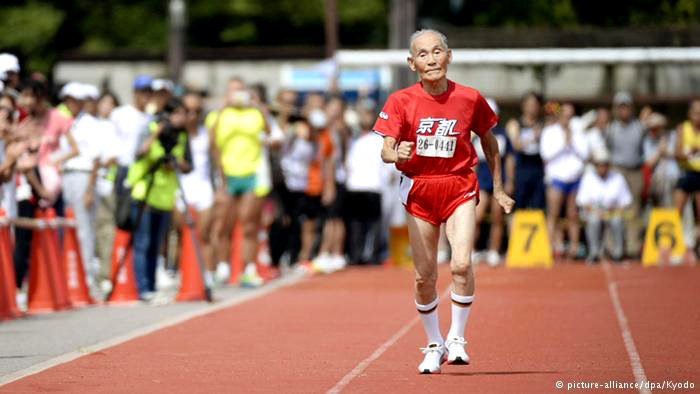 Hidekichi isn’t the fastest 105-year-old sprinter. That title belongs to Poland’s Stanislaw Kowalski, who ran the 100 in 34.50 three months ago. All hail Hidekichi for his wonderful effort, but he still has 8 seconds to go. He says he’ll compete at Japan’s masters nationals next month. Guinness World Records are nice, but WMA maintains the official records. Time for the M105 age group to be added to records site. Golden Bolt looks the part at well-publicized Kyoto race a day after turning 105. A fleet-footed Japanese centenarian raced into the Guinness World Records reference book on Wednesday and declared himself a “medical marvel” as he continues to stalk sprint king Usain Bolt. Hidekichi Miyazaki, dubbed “Golden Bolt” after the fastest man on the planet, clocked 42.22 seconds in Kyoto to set a 100 metres world record in the over-105 age category — one for which no mark previously existed — a day after reaching the milestone age. Indeed, so leisurely was his pace that Bolt could have run his world record of 9.58 four times, or practically completed a 400 metres race — a fact not lost on Miyazaki. “I will say this: I’m proud of my health,” added Miyazaki, the poster boy for Japan’s turbo-charged geriatrics in a country with one of the world’s highest life expectancies. 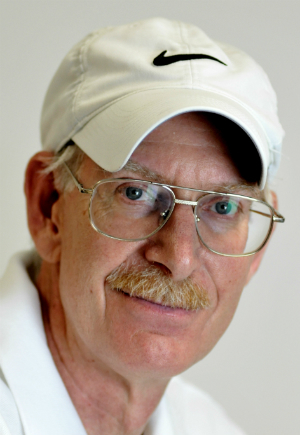 “The doctors gave me a medical examination a couple of days ago and I’m fit as a fiddle. Dressed in his trademark red, tight shorts hiked alarmingly high, Miyazaki got off to a wobbly start before finding a gentle rhythm and trotting across the finish line to loud cheers, greeted by his great-grandchildren carrying bouquets. Cheekily, he celebrated by striking Bolt’s famous “lightning” pose before being presented with a certificate from Guinness officials. 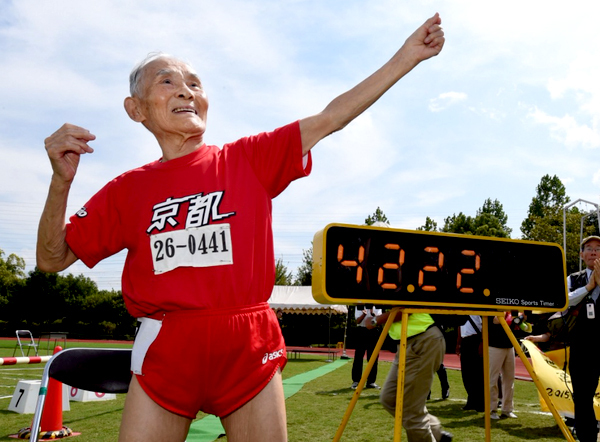 The twinkle-toed Miyazaki, who holds the 100 metres world record for centenarians at 29.83 seconds, insisted there was still time for a dream race against the giant Jamaican. “I would still love to compete against him,” said Miyazaki, who loses valuable seconds because he cannot hear the starter’s gun go off. Miyazaki, who was born in 1910 — the year Japan annexed Korea and when the Titanic was still being built — only took up running in his early 90s and prepares for races by taking a sneaky catnap. He stands just 1.53 metres (five feet) tall and weighs in at 42 kilograms (92 pounds). Japanese television crews jostled as Miyazaki, a native of tea-growing Shizuoka prefecture, arrived for his record tilt sporting dapper white slacks and a Panama hat. Job done on the track, the Japanese iron man proved he was a dab hand at the shot put, tossing a best effort of 3.25 metres before calling it a day. Pro at 105 ? That sounds confusing. EMA has proved the [Polish M105] record and we accepted this record. The birth certificate was send to us and we accepted it. The documents were sent to Sandy Pashkin – it is her duty to put the record on the website of WMA …. The other question to the Japanese runner: did he send a birth certificate to WMA as well? Is a birth certificate valid, when the original certificate doesn’t exist anymore? What happens to all the “old athletes” who were born during the first or second world war, when documents were destroyed? How can we prove the date of birth when governments are not able to verify a birth just on the day or a day after? Or countries which never give out birth certificates – only when someone asks for and another person (fiend, uncle, son, …) verify it? LOL! at this point in their life we may have to cut them some slack. 105 years old, lived through some tough times and still competing. Truth? Wow, tough one to dig back for at this point.